Lovable and Capable With an Illness? we are no longer loveable. Vicki assures us we are. “At my first defense, no one came to my support, but everyone deserted me … But the Lord stood at my side and gave me strength, so that through me the message might be fully proclaimed and all the Gentiles might hear it. And I was delivered from the lion’s mouth” (2 Timothy 4:16-17). The paper banner taped to the wall read I. L. A. C.
“Pretend you have a sign inside that reads, ‘I’m lovable and capable,’” I told my students. Each of them had multiple disabilities and struggled with emotional issues. The interactive sign would help boost their self-esteem. And assist them in communicating their feelings. If they felt inadequate to meet a challenge, they’d tear off a piece of the banner. Symbolizing their sadness and diminished confidence. If they accomplished a difficult task, they’d tape a piece of paper to the banner. Conveying their increased confidence and pride. Providing tangible evidence of their achievement. Decades later, I have a new perspective. As a believer I yearn for God’s love and rely on His help. So why do I sometimes allow my disease to make me feel unlovable or incapable? It’s because I can’t resist the temptation to admire my I. L. A. C. sign. Wow! Look what I did! I ran three errands and did water walking today! Such self-celebration negates God’s power working in me. The lesson: God’s power remains boundless regardless of small numbers or limited ability. Our weakness helps us understand His strength. What happens when symptoms stifle our ability to accomplish things we once excelled at doing? Or when our illness makes us feel unlovely? Like Paul we can find ourselves feeling deserted. But then we notice one Friend faithfully standing by. Giving us strength needed for the moment. And loving us more than we could ever imagine (Ephesians 3:19). Prayer: Dear Father, Forgive me for prideful wishes to be noticed for what I can do. When others see me, help them see only You. When I feel unlovely, give me a vision of how You see me. Help me focus on inner beauty. Thank You for the access I have to Your power. And for Your unconditional love. In Jesus’ name, Amen. What worship song keeps your focus on His love and power in your life? Filed Under: Depression, Devotionals, Hurt Feelings, Loneliness, Love, What's New? 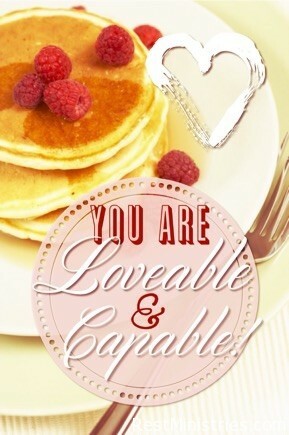 13 Responses to Lovable and Capable With an Illness? I love this, Vicki. I try to remember we are lovable and capable through Jesus, but it’s hard sometimes. This line especially comforts me today – “God’s power remains boundless regardless of small numbers or limited ability.” Thank you for reminding me of God’s power! “I try to remember we are lovable and capable through Jesus, but it’s hard sometimes.”: It’s hard for me many times. I find that I need to remind myself each morning and often throughout the day that I’m only capable because of Christ power in me. Gotta love heavenly math: our limited ability + God’s boundless power = experiencing and understanding His strength. I’m grateful God used this message to touch your heart. Isn’t it awesome how our heavenly Father has unlimited strength and we get to experience it? There’s such a fine line between being “responsible” in doing things & trusting in God’s strength. I tend soooooo often to swing between either/or, rather than both, BUT with God taking charge….. NOT me!!! Oh I go through this lesson over & over again!! 😉 Sigh! Yes, Kerryn, “Living Water for a thirsty soul’ flows freely from our faithful Friend. Vicki, what a great thing you did with the ILAC banner! But, you’re right, as Christians, it’s God shining and working through us that’s the right way to think of what is known as “self esteem”. Your devotional is so very good and reassuring. I’ve been enjoying the comments as well. Me too Kerryn. Swinging back and forth, going through the lesson of our partnership with the Lord, with Him providing what I need to say or do anything worthwhile. So what you’re saying is that we think alike? Encouraging for me (to think like you)…scary for you (to be thinking like me!). I, too, am enjoying the conversation…That’s what makes this ministry so rich. Each message resonates with us in different ways (depending on our illness and our current situations/challenges). I’m always delighted to read how God uses the messages to encourage others (different trails, but the same God!). HI Vicki – am wandering “way back” to catch up on devotionals as it has been a couple of weeks of my not being able to comment. I remember reading this one of yours, though! Naturally I loved thinking of you and your students with the I.L.A.C. banner. I may speak for many here when I say that I never feel “any strength” even while He is helping me to do the dishes or take a shower; let alone get out to do grocery shopping or an occasional social outing. In those moments, I “know” it is his strength as all I “feel” is weak. Truly, it is humbling and wonderful all at the same time to say – feeling more weak at the end of completing any of the things mentioned above – “Lord, thank You that we could get that done today! On the days when little is done or accomplished, it takes his strength to surrender to simply resting. I recently heard a new ( to me ) worship song that I have had on auto-replay many a day it inspires me so and fills my living space with the reminders I never want to forget. I discovered it when doing a daily meditation program that always begins with a portion of music. The songwriter is prolific within the Catholic tradition: Margaret Rizza. Her work is most often done by choirs and more than once, her various songs inspire me. from the album “Fountain of Life”. Give me your peace, Lord, set me free. It is not on YouTube or I’d post it but it IS in the iTunes store with a short clip which gives one a sense of its peaceful meditative message. I downloaded it from there and am ever grateful to have it to play.